The flowers is a unique bright orange colour with a nice mellow shade! It is impossible to adequately describe it. A real eye catcher! Origin and Habitat: Amblayo, Salta, Argentina. Altitude range: 2800-3600 metres above sea level. 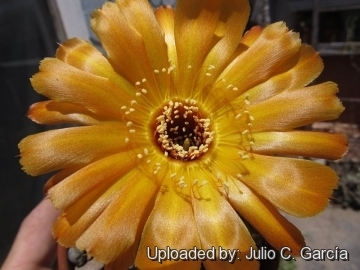 Description: Echinopsis amblayensis (best known has Lobivia haematantha var. 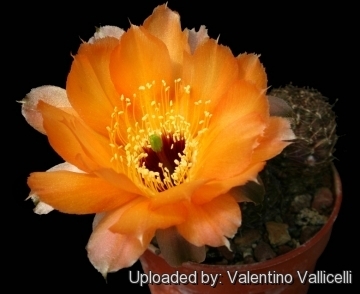 amblayensis) is a local or morphological form of the very variable Echinopsis haematantha characterized by rich orange-red flowers and green stigmas and now fully synonymized with the latter. It quite is variable and has also received many names. 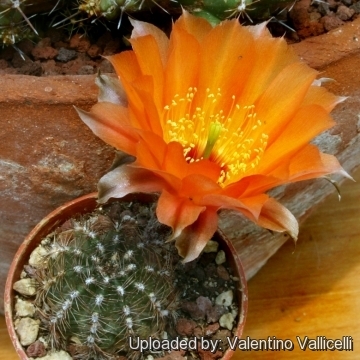 Anyway (whatever the scientific name is) this easy to grow cactus is highly priced for its vibrant orang-red blooms. 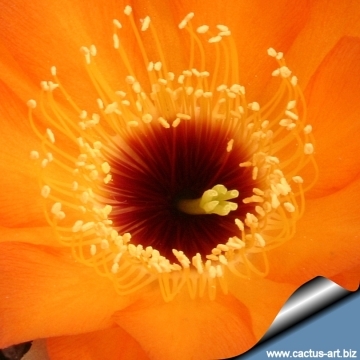 Habit: it is a small compact small clustering cactus. Stem: Black-green with woolly areoles. Spines: Short, whitish-cream to almost black. thin and spreading. Flowers: Approx. 5.5 cm long, 4.5 cm in diameter typically orange with a green stigma (but the colour of petals may vary from orange to red and stigmas may also be orange or red). Blooming season (Europe): Flowers are produced in spring and remain open for about three or four days. 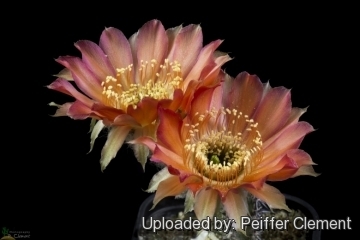 Remarks: Echinopsis haematantha is a widespread and variable species that has received an undue number of names. 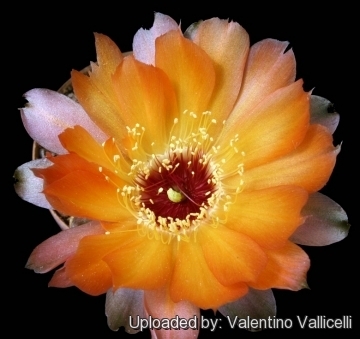 The differences usually concern the colour of flowers sometime with a more pink-orange or dark red tint. 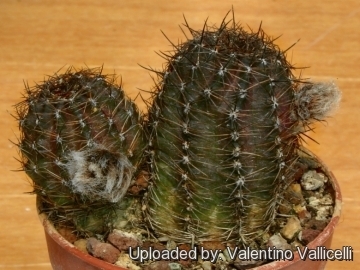 The colouring, size and density of spines is also quite variable and is greatly influenced by the conditions of culture, at lower light levels the spines are less numerous, delicate and white, while with strong solar radiation the spines are stronger with a darker tint. 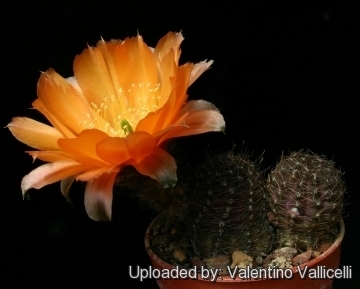 Cultivation and Propagation: Echinopsis amblayensis is a summer grower species that offers no cultivation difficulties. Soil: Use a very a particularly draining substratum, as it is very sensitive to rottenness when in presence of humidity and low temperatures and let the soil dry out between waterings. Exposure: It needs bright sun, but, as a former mountain dweller, does not care for extremely high temperatures in summer. 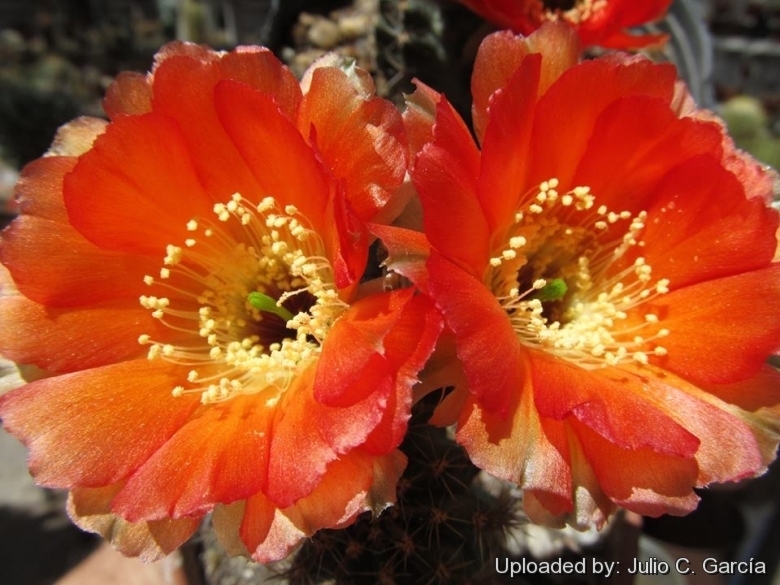 Hardiness: It is a quite frost resistant cactus, hardy to -5° C. However in cultivation it is better not to expose it to temperatures lower than -0° C, even if in an aerated and protected location, in order to avoid the formation of anti-aesthetic spots on the epidermis. In presence of high atmospheric humidity avoid any frost as it is particularly sensitive to root rot. As these are high-elevation plants, they don't like to get overheated. Propagation: Direct sow after last frost, grafting or by offsets (if available), provided left drying up well, in summer.